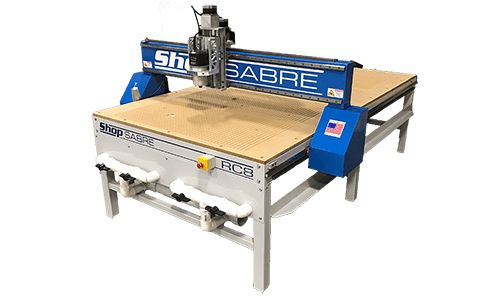 Why Buy a ShopSabre CNC Router? 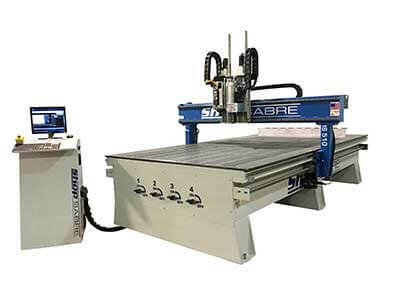 At ShopSabre, we believe industrial strength and customer service are the two most important elements of a CNC router. 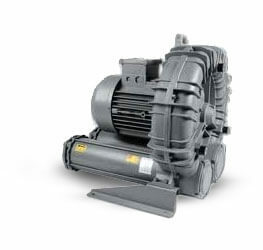 Our machines are designed to industrial specifications so you can use them as much as you need, all day, every day. We build our machines so you as the owner/operator can go to the machine, turn it on, and go to work any time, no squaring or alignment required. Every ShopSabre CNC router is built to use and built to last. These are just a few of the many advantages ShopSabre CNC routers have over the competition. Click the button below to learn more about why our CNC routers are a superior value to the competition. What types of material can I cut with my CNC router? Due to the technology advantages of our routers, we are able to provide you with more cut forces than the average CNC router and therefore with appropriate tooling can handle many different materials. Some of the materials you can cut with your ShopSabre CNC router include wood, acrylic, aluminum, brass, plastic, foam, phenolic and other solid surface materials. Where are your CNC routers made? All ShopSabre CNC routers are 100% American made. From the engineering to welding, painting, wiring, and assembly, we truly are the manufacturer. We use only the finest quality materials and build all of our machines right here in the our facility in Elko, Minnesota. How can you offer such great quality for such a low price compared to competitors? Our machines aren’t the cheapest, but they are the best value. Unlike cheap imports and other low cost American companies, we use only the highest quality materials and build technology. Using these materials and technology actually helps us to cut costs by reducing our overhead and labor times while also reducing our support demands in the field. This also allows us to provide free lifetime technical support with every new ShopSabre machine. What is included in your lifetime tech support? When we say free lifetime tech support, we mean we’ll do everything we can to support your machine for as long as you own it. We offer free and convenient tech support via email, phone, and internet connectivity. In rare cases, it may be necessary to send a technician out to service your machine at an additional cost determined by the specific situation. While on-site support is not free, it is very rare since our phone, email, and on-board diagnosis systems allow our team to be more hands. We have the top-rated support in the industry, and we can often solve your issues remotely. What do I do if my machine stops working? Contact our support team immediately and we’ll help you troubleshoot. In rare cases, we may need to provide on-site support, but we suggest getting in touch with our team first as in many cases on-site will not be necessary. As a valued ShopSabre customer, you can expect that we will do everything we can to get your machine working immediately with minimal expense to you. How do I know your machines are as good as you say they are? Our many satisfied customers can back up our promises to you. Simply ask for references or see what real ShopSabre owners have posted about our products and service. We stand behind every aspect of our machines, but we don’t want you to take our word for it. We also encourage you to look at more expensive machines and compare the quality to one of ours. Most of our customers who’ve purchased other machines or have seen other machines in action are blown away by the quality and value of our CNC routers. What if I have never used a CNC Machine before, will I be able to figure it out? Many of our clients are first time CNC users. With our lifetime technical assistance, you can be assured you’ll always have someone to speak with when you need help. 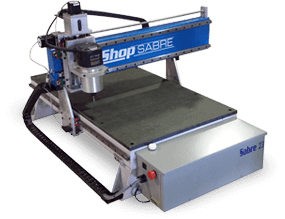 We also include access to the ShopSabre basic training class with every purchase of a new ShopSabre CNC Router. You’ll get hands-on experience without the expense of paid training. We also include a manual with the machine and software that has built-in tutorials.